It would be quite the stretch to comprehend something even more spectacular than La Femme’s first LP, Psycho Tropical Berlin, released in 2013—but then there is their newest release, Mystère. 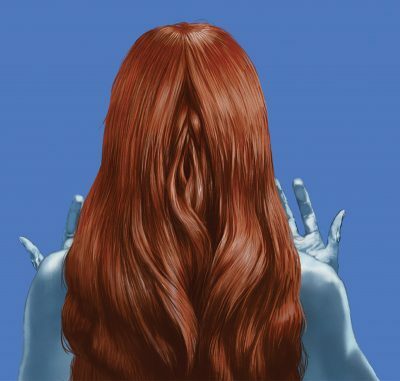 La Femme out do themselves yet again as Mystère is the wonderful continuation of their unique darkwave, psychedelic punk infused within the layered depths of krautrock. As expected, their sound remains stunningly eerie and instantly captivating. Its hypnotic charm lulls the listener on soundwaves meant for romantics otherwise blissfully damned. Simply put, it is a brilliant work of art, and you would benefit from its continual presence on your turntable or playlist. These cats have a special talent, and you’d be amiss if you did not check this album out. It’s indie psychedelia with aspects of coldwave whose creative composition follows close behind in the footsteps of greats like The Velvet Underground, Kraftwerk, Roxy Music and many others. The unique quality that La Femme boast is their subtly and forever cool invocation of a carefully orchestrated sound. Other groups that muddle this genre risk relying on shock and awe via a heavy synthesizer presence that many times is too overbearing. In contrast, La Femme has an element that calmly invites listeners onto a journey via a gradual but rising pace. When the needle drops on Mystère, the result is like being enveloped by all that is magical and grandeur. In its entirety, the record is a ride that initially must be experienced from start to finish. It’s an expedition that guides the forever curious mind through all things vibrant and intriguing. All 15 lengthy tracks manage to fascinate an otherwise wayward mind. Each one strangely bewitches with a surprising yet intimate substance. Numbers like “Tatiana” and “Septembre” maintain a comfortable similarity to Psycho Tropical Berlin. Mystère begs further digestion of other tracks for a more thoughtful consideration: “Le vide est ton nousveau prenom,” “Exorciseur” and “Mycose.” The subsequent experience will be one of serenity, especially if you add “Psyzook” to the mix.